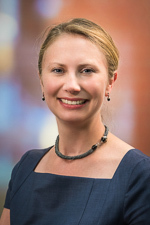 Dr. Pletneva is an assistant professor of pathology at the University of Utah School of Medicine. She completed the Medical Scientist Training Program and earned her MD and PhD degrees from Johns Hopkins University School of Medicine. She completed residency in anatomic and clinical pathology, as well as fellowships in hematopathology and surgical pathology with concentration in gastrointestinal pathology at University of Michigan. Her research interests include improvement of diagnostic tools for graft-versus-host disease and novel diagnostic approaches and predictive factors for lymphoproliferative neoplasms.